The loft’s sloping floor is emphasized by positioning larger pieces of aggregate in the terrazzo floor along the lower canal side of the living room. View from mezzanine to the bedroom. Alley view from bedroom window. 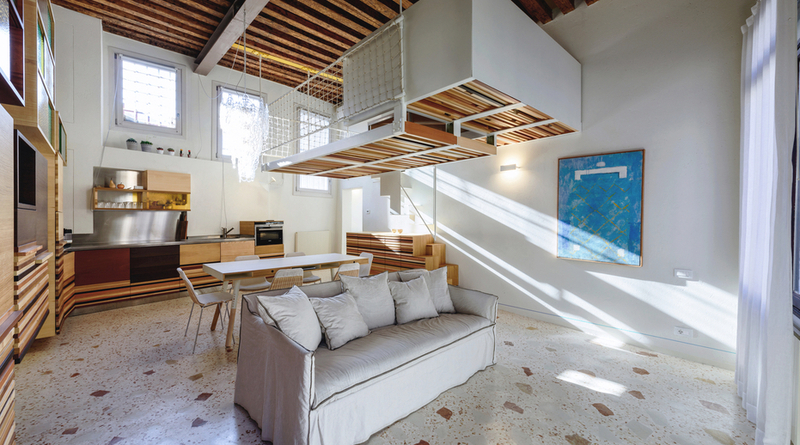 Elasticospa’s bright and airy loft in Venice highlights the instability that affects all construction in this floating city. Venice can be unsettling. Getting lost is inevitable: in its winding alleys, perspective is rarely available. 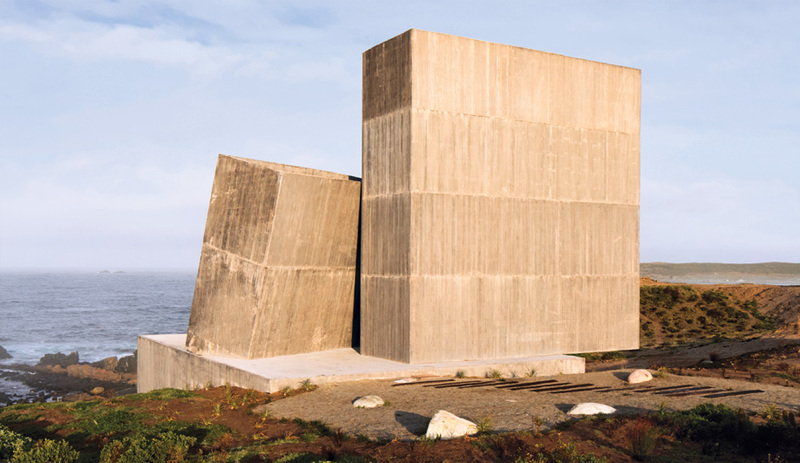 Unless you are viewing it from the water, it presents itself in a series of close-ups, and visitors might fail to notice that much of it is leaning. 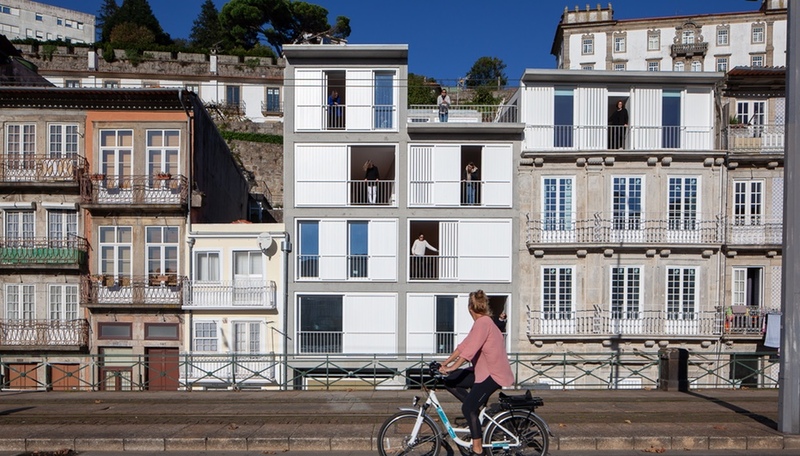 Constructed on the water, Venice is in fact floating and in continuous motion. 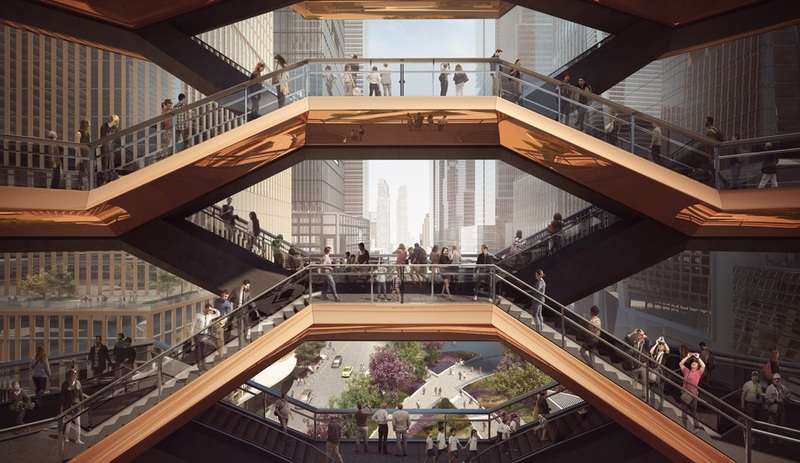 Through osmosis, water is drawn up into the molecules of the construction materials, rising even to the top floors. 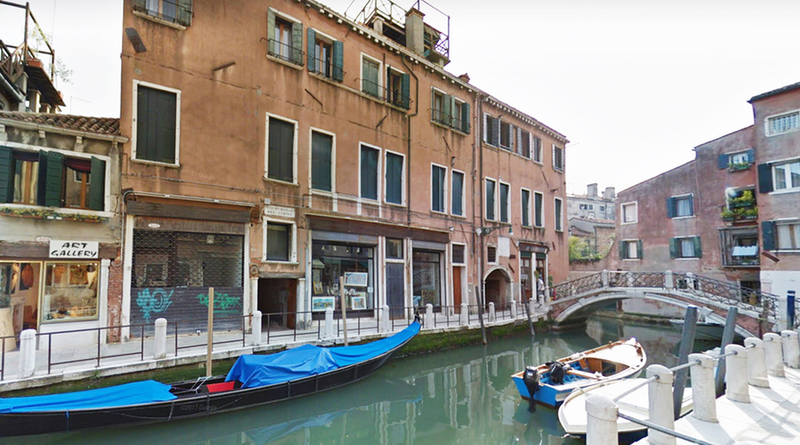 As a result, the walls and floors of its buildings are almost never horizontal; its grand palaces and even its more modest dwellings tend to lean towards the canals, producing a sense of instability on the inside that the Venetians have adapted to in one way or another. 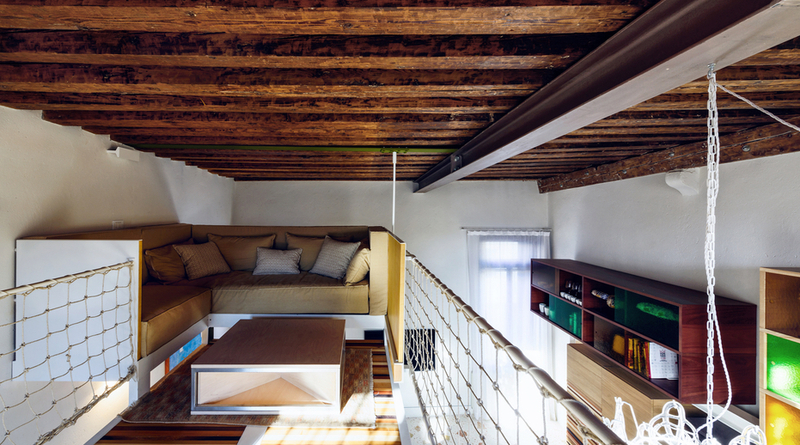 It’s this tension around the city’s delicate balance and unsteadiness that Elasticospa, the Torino-based architecture office founded by Stefano Pujatti, is looking to exploit in this loft near the Rio delle Toreselle canal, a few steps from the Guggenheim Foundation. A short hallway leads from the entrance door into the main living space. 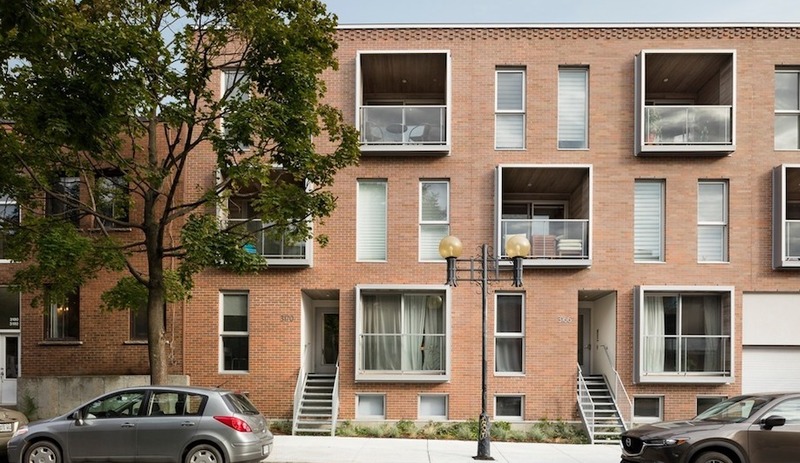 Designed for a local company to host clients in Venice, the loft is located in a typical walk-up residential building. 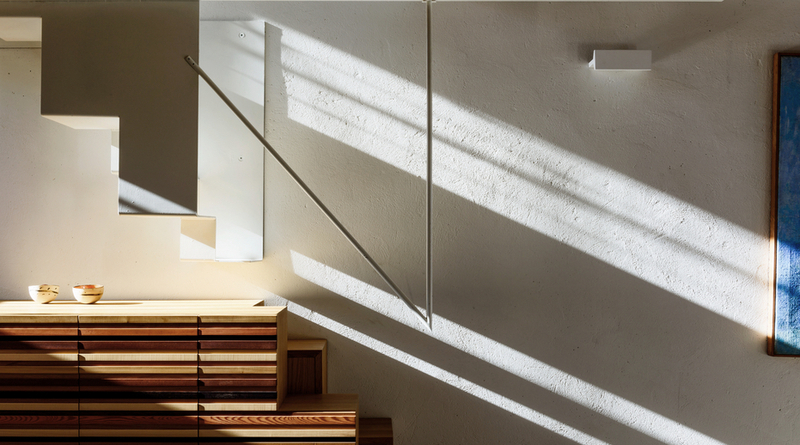 From the entrance, a short hallway leads into the double-height living space – a surprisingly bright and airy environment in which most of the elements have been custom-designed and built. Rather than mask the fact the floor slopes significantly towards the canal (about 25 cm from one end to the other), Elasticospa chose to emphasize the inclination by playing with the terrazzo flooring. Larger pieces of aggregate are aligned along the lower canal side of the room, with finer grained material on the higher side, in a nod to the sedimentation that might occur naturally moving from a water course to higher ground. 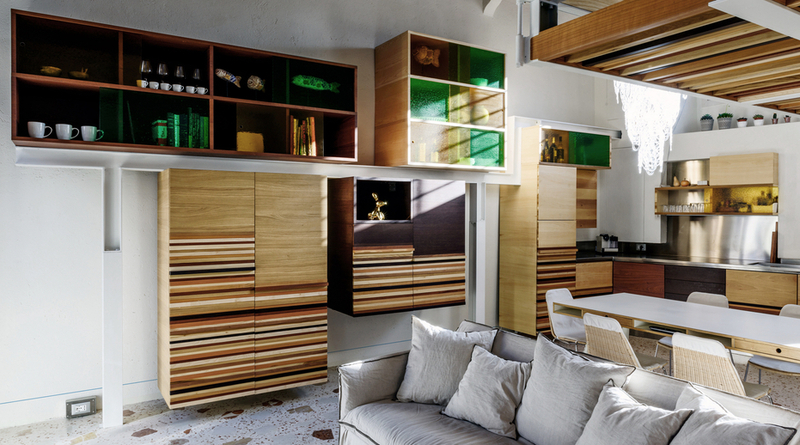 A single-run staircase rises off the built-in credenza on the main floor up to the mezzanine. 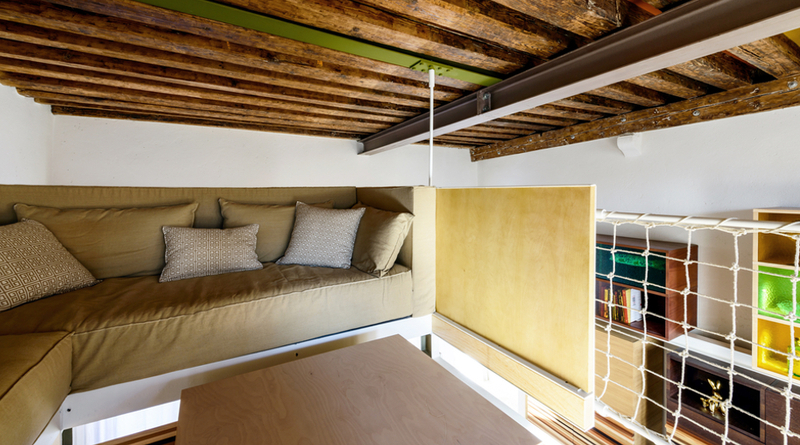 Most of the furniture in the loft was custom-designed and built to float off the floor. 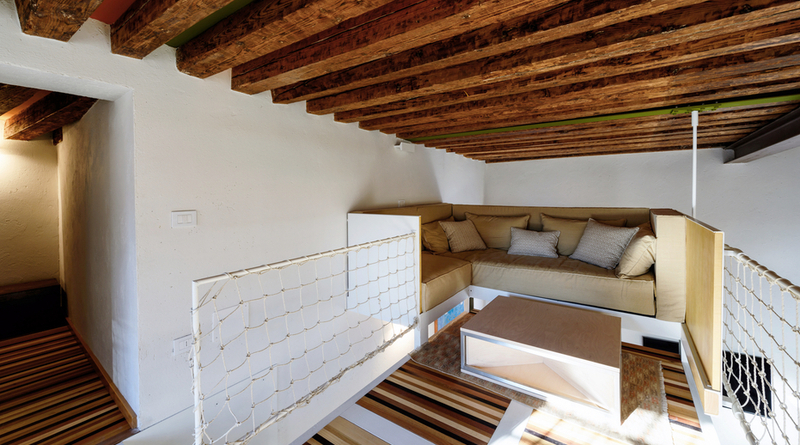 Among the other de-stabilizing elements is the mezzanine structure – suspended by three metal rods and enclosed with an open-weave rope railing – outfit with a built-in sofa to create an intimate aerie. 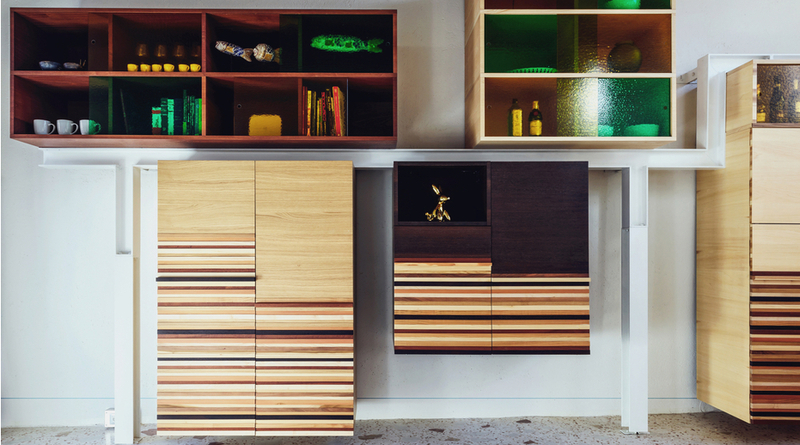 To reach this eagle’s nest, one climbs a stair that zigs off the end of the wooden dining credenza and then translates into metal cubes that permit the placement of one foot per rise. 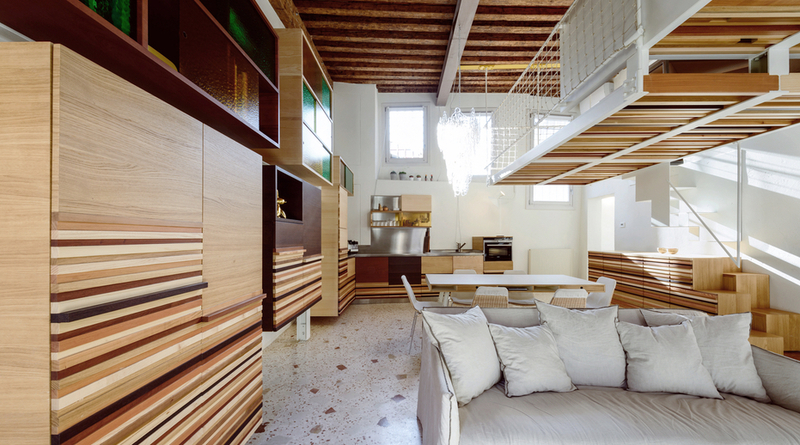 From the mezzanine, a passageway leads to a compact bedroom, with the bed raised on a canted platform. At the head of the bed, an unexpected window overlooks the alley below. 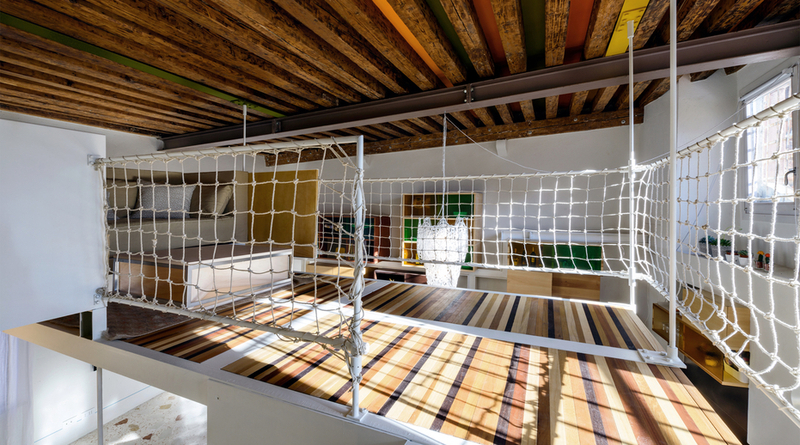 The mezzanine is suspended by three metal rods and enclosed with a loose-weave rope structure. 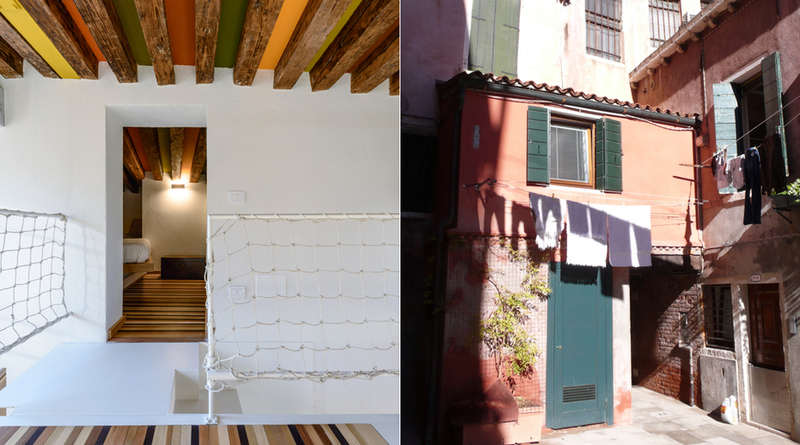 The colour palette applied between the roof timbers and for the wooden flooring and millwork evokes traditional Venetian craftwork. The bathroom is tucked below the bedroom and accessed off the entrance hallway, where a sense of compression yields to a feeling of expansion upon entering the main living space. 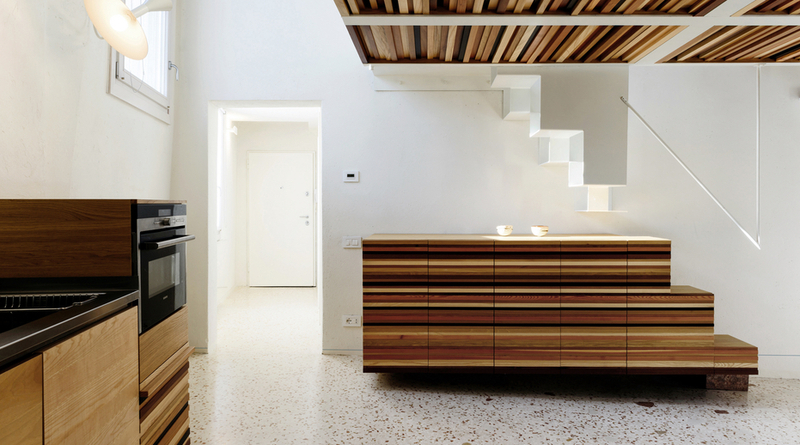 The use of various woods in a horizontal orientation emphasizes the slope of the floor, while the colour palette employed in the millwork and in between the roof timbers evokes traditional Venetian craftwork. 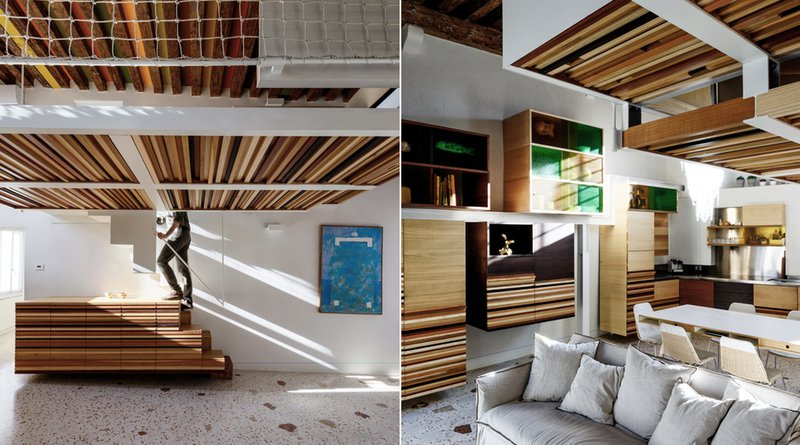 The built-ins, the pervasive use of wood, the single-run stair and the floating mezzanine all combine to create a secure ship-like feeling in the space. That envelopment is ever so slightly undercut by the sloping floor, a reminder of the fragility of the special ecosystem that underlies all construction in Venice.